Dietary fibre is one of the things that tends to be low down on the list of nutrients that we talk about. Not only can fibre be seen as a bit boring and something only the health-conscious worry about (remember the F Plan diet? ), but people tend to shy away from talking about their bowels and how their diet might be affecting them. Despite this, fibre remains a very important part of a healthy balanced diet. Studies have shown that a diet high in fibre can help prevent heart disease, diabetes, weight gain, some cancers and can also improve digestive health. The problem is that many people in the UK just don't eat enough. We should be eating at least 18g of fibre every day, but most people fall short of this figure. The consequences of not having enough fibre can include constipation and poor digestive health, possibly leading to symptoms including bloating, stomach pain and general sluggishness. Where do we get fibre from? Fibre is only found in plant foods so foods such as meat, fish and dairy don't tend to contain any fibre unless it is added. Soluble fibre can be digested by your body and is helpful in managing blood cholesterol levels. This type of fibre is useful to help prevent constipation and relieve existing constipation as it can help to soften stools and make them easier to pass. Good sources of soluble fibre include beans, lentils, oats and fruit. Insoluble fibre can't be digested by your body . This is what gives 'bulk' in our diets and helps to move other food through our digestive systems properly. This type of fibre helps to keep our digestive system healthy and prevent digestive problems. 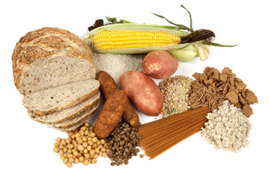 Good sources of insoluble fibre include wholemeal bread, wholegrain breakfast cereals, brown rice and many fruits and vegetables. Most food packaging now gives the dietary fibre value of the food. If you keep in mind the figure of 18g per day, you can make a judgement on how much the food will contribute to your daily target, but be sure to look at the 'per serving' figure, not per 100g! Increasing fibre in your diet is not only a positive move to improve your digestive health, but eating foods that are higher in fibre can help you to feel fuller for longer, helping with weight loss too. It's best to gradually increase fibre in your diet rather than a big jump overnight as a fast increase can result in bloating, excess wind and stomach cramps. Building up fibre gradually helps your body to get used to the added fibre. It's also really important to increase fluid consumption as you increase fibre. Water is the best option but other fluids including tea, coffee, milk and juices are all beneficial. Remember that when you go on a calorie controlled diet you will be eating less food. This means less bulk and less waste coming out the other end! Some people mistake going to the loo less (because you're eating less) with constipation. Remember to bulk up your diet with plenty of fruit and vegetables to keep things moving. Eat at least 5 portions of fruit and veg every day. Make whole grains the rule and processed grains the exception i.e. choose brown not white! Always have breakfast and choose a high fibre cereal or wholemeal toast as part of a balanced breakfast. Replace meat in casseroles and stews with beans (e.g. kidney beans or chickpeas) and lentils - not only are you cutting down on calories, you'll also be bumping up your fibre intake too. Gradually increase your fibre intake including different sources of fibre, both soluble and insoluble. Increase the amount of fluid you drink - water is best but other fluids are also useful. Drink diluted fruit juices (apple, orange or prune juice for example) to help relieve constipation. Get plenty of exercise. Trying to increase the amount of exercise you do can really help to both relieve and prevent constipation. If diet and lifestyle changes aren't effective, your GP may decide to prescribe a laxative. Sometimes a short course of laxatives can help to restore normal body functions although these shouldn't be relied on in place of a healthy, balanced diet, regular exercise and plenty of fluid.